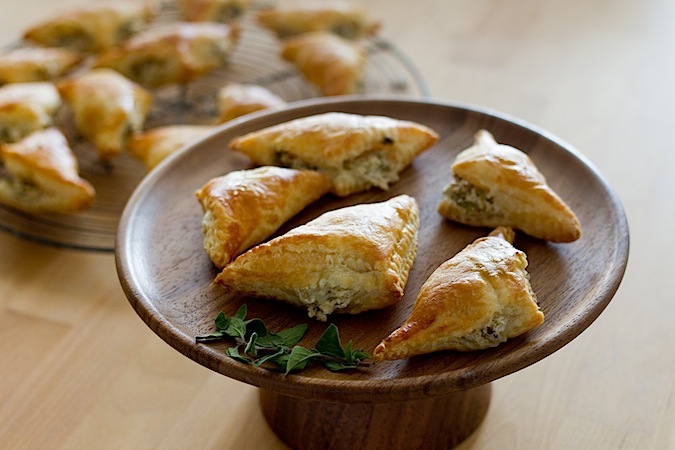 Before I share this amazing Olive and Goat Cheese Turnovers recipe with you, I wanted to tell you about a fun event we are participating in this month; Kitchen PLAY. don’t know about you, but I love playing in the kitchen and get really excited when offered the opportunity to try new gadgets and ingredients. Don’t we all love to play in the kitchen; after all, isn’t that why you are here? Kitchen PLAY represents a new sponsored Progressive Party every month with six food bloggers. Each food blogger is assigned one of the following courses: cocktails, amuse bouche, salad, appetizer/soup, entree, and dessert. All bloggers have to incorporate the same kitchen tool or food product into their course. Sounds fun doesn’t it! I was thrilled when I was asked to play along this month. The sponsor for this month’s Progressive Party is Lindsay Olives. Lindsay Olives are located in the central valley of California, where the sun shines, and it gets hot. Perfect weather to grow delicious olives. I love that they do not use any preservatives when processing their olives. Just ripe, natural, goodness with every bite! Lindsay Olives are currently celebrating the theme “Life Should Taste Good”, and I cannot agree more. Life should taste good. I was assigned to bring an appetizer to the party using at least one Lindsay Olives product. Once I read up on the different olives, I decided to use two different types: green ripe olives and black medium olives. Normally when I make this recipe I only use black olives, but after I read about how “buttery” the green olives were, I had to throw them in. This recipe is the perfect starter for your next dinner party. Buttery puff pastry wraps around tangy goat cheese that is full of ripe olives, lemon zest, and fresh oregano. Let puff pastry thaw at room temperature, according to directions on the packaging. In a large mixing bowl, using a fork, break up the goat cheese, until smooth. In a food processor, mince the shallot into small pieces. Remove from the food processor. Then do the same process with the olives. You will need to use the pulse mode so that you do not over process the olives into mush. Gently heat the olive oil, over low heat, in a frying pan. Add the shallots and cook until soft; about 3 minutes. Add the olives, stir, and cook over low heat for another 5 minutes. Stir in the lemon zest, and the oregano. Remove from the heat, and season with pepper. Let cool. Once cooled, add to the goat cheese, and using a fork, stir until mixed. 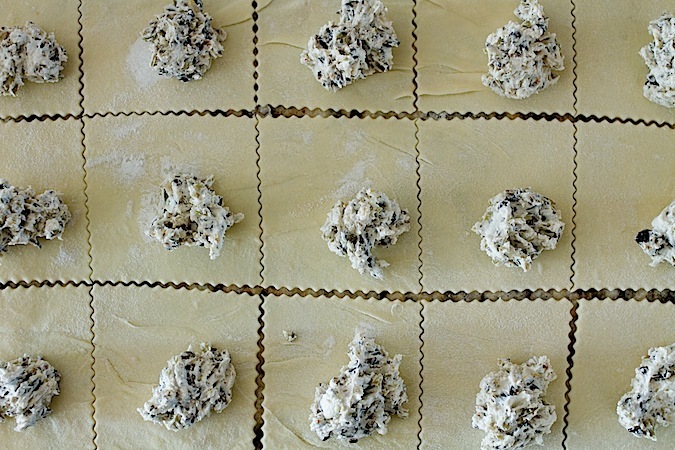 On a floured surface, roll out the puff pastry into a large square. Cut into equal sized squares: about 14 squares per rolled out sheet of puff pastry. You can go a little smaller or larger, depending on the look you want. Put a teaspoon of the goat cheese mixture on one corner. Using a pastry brush, dab a little water, around the sides of the cut square, and then fold over to make a triangle. Put onto the baking sheet. Make an egg wash with the egg, and a tablespoon of water. Mix very well. Using a pastry brush, lightly brush the tops of the triangles. Bake for 12 – 15 minutes, until puffed, and golden. ** Disclaimer: This post is sponsored by Kitchen PLAY and Lindsay Olives; opinions stated are my own. 15 Responses to "Olive and Goat Cheese Turnovers"
Oh my gosh. 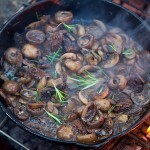 I want these for breakfast! They look and sound fantastic! It's been far too long since I've had savory pastries -- I need to make these! The filling sounds fantastic! These look so perfect and I bet they are just as tasty! This is my kind of appetizer! These turnovers look like a wonderful way to showcase the olives. I'm actually thinking about recreating it. :-) Happy New Year! Using the word 'buttery' to describe green olives has me drooling. Frankly, anything that has the word 'butter' in it has me drooling.